April 30, 2011  The UN Human Rights Council voted Friday to investigate Syria's bloody crackdown on protesters. The action gives the Obama administration a reason to argue the council was worth joining, despite critics who say it's not worth the effort. April 12, 2011  The Obama administration is sending another official to Saudi Arabia to try to smooth over relations damaged by the so-called Arab Spring. The Saudis think the U.S. is being naive about the democracy movements and canceled recent plans for Secretary of State Hillary Clinton to visit. They hosted, but only briefly, Defense Secretary Robert Gates last week, and this week it is National Security Adviser Tom Donilon's turn. Analysts say it will be difficult for the U.S. to support democracy in the Middle East and keep this strategic alliance on track. April 8, 2011  The secretary of state unveiled the 35th annual human-rights report Friday — amid a crackdown on dissent in China. Clinton said the struggle for human rights begins by telling the truth — and in China that means highlighting the plight of political prisoners, who are growing in number. April 8, 2011  The State Department's point person on human rights says his office is in a "cat and mouse" game with authoritarian governments that are trying to restrict free speech on the Internet. April 7, 2011  U.N. Secretary-General Ban Ki-moon is visiting Capitol Hill, where some want to cut funding to the U.N. and pressure Ban to make changes. On the U.N.'s recent assertiveness in Libya and the Ivory Coast, Ban says the alliance is doing its "proper work," having learned "from the tragic lessons of the past." 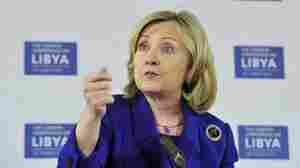 March 30, 2011  Secretary of State Hillary Clinton will be on Capitol Hill on Wednesday, facing a closed-door grilling on U.S. policy in Libya. She's likely to face some of the same questions that she and her coalition partners grappled with at the London conference Tuesday, such as: What's the end-game with Moammar Gadhafi? 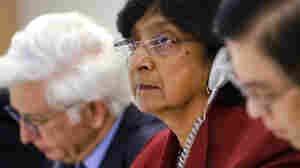 March 22, 2011  The international intervention in Libya has drawn attention to several women in the Obama administration who are proponents of a principle known as the "responsibility to protect." But others question this idea that U.N. member states need to step in when civilians are at risk. March 17, 2011  Secretary of State Hillary Clinton says enforcing a no-fly zone in Libya would require bombing raids — one of several options being debated by the U.N. Security Council. Clinton made the comments while visiting neighboring Tunisia — where she met aid workers who have been helping refugees from Libya. March 16, 2011  While in Cairo, Secretary of State Hillary Clinton pays a visit to Tahrir Square — the site where the revolution in Egypt began. March 15, 2011  Secretary of State Hillary Clinton arrives in Cairo to meet with its new government after meeting a Libyan rebel representative in Paris. 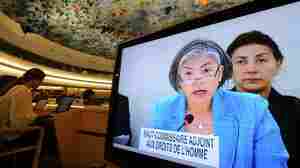 In Paris, she was bombarded with questions she dodged about the growing confrontation in Bahrain after Saudi Arabia and other Gulf states sent troops there to shore up King al Khalifa. March 12, 2011  For decades, the U.S. relied on Arab autocrats to provide stability in the Middle East. Now the U.S. is desperately trying to stay in the game, and officials say they will start shifting assistance to support the democratic aspirations and the economic empowerment of protesters. March 9, 2011  As political uprisings transform the Arab world, Secretary of State Hillary Clinton is urging governments to include women in decision making. 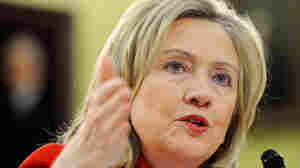 Clinton has been an advocate of women's rights and has highlighted that during her tenure at the State Department. February 28, 2011  Secretary of State Hillary Clinton is in Geneva, consulting with European partners on how to end the bloodshed in Libya. 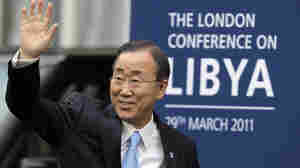 The United Nations Security Council authorized an arms embargo and targeted sanctions against Gadhafi and his close associates. February 25, 2011  The United Nations' top human-rights official has said the world must "step in vigorously" to protect Libyan protesters. And the United States is imposing targeted sanctions and working with others to try to step up the pressure on Libyan leader Moammar Gadhafi's regime.